This article was written By Tom Kent-Williams on 08 Jun 2011, and is filed under Reviews. 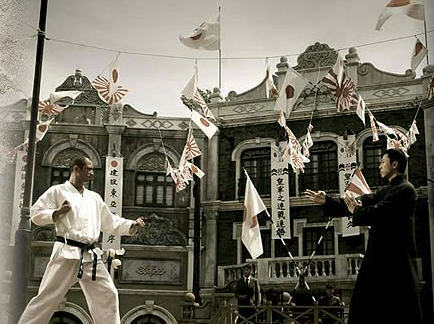 When the 1937 Japanese invasion of China hits Foshan, the home town of the legendary Wing Chun master Ip Man (played by Donnie Yen), he is robbed of his wealth, home and dignity. Given the chance to use his skills in the martial arts to fight for his survival, Ip takes on the enemy led by Japanese general Miura (judo practitioner Hiroyuki Ikeuchi) and fights for freedom for him and his people. 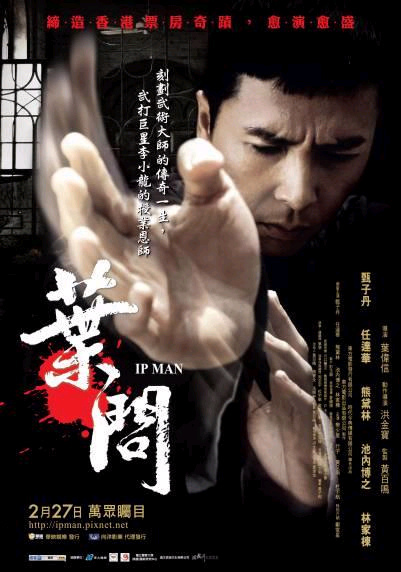 A semi-biographical tale loosely based on events in the real Ip Mans life, Ip Man is director Wilson Yip and star Donnie Yen’s fourth film collaboration. Originally an abandoned project of filmmakers Jeffrey Lau and Corey Yuen, the film was eventually made with full consent from Ip Man’s sons and went on to win awards for Best Film and Best Action Choreography at that year’s Hong Kong Film Awards, despite being nominated in a total of twelve categories. Like the other much-hyped and much-praised film in Donnie Yen and Wilson Yip’s ouevre, 2005’s Sha Po Lang, the film is a dazzling tribute to the Hong Kong cinema of the 80’s, boasting amazing action from veterans Sammo Hung and Tony Leung Siu-hung. Ip Man, however, is very quick to back it up with with a very rich and emotionally-involving plot, making the fight scenes not only pleasing on an aesthetic level, but dramatically sound also. Donnie Yen, who has not exactly been praised for his acting talent throughout the years, takes the role of the timid but heroic Ip and makes it 100 percent his own. Yen plays Ip as a man of morals and principles, always formidable and courageous despite the situation he is faced with. Along with how evil and villainous the Japanese are portrayed in the film, the audience is almost forced to invest emotionally into the plight of Ip and his wife (Lynn Hung). Qualities aside, the film has been slated by some critics as being poorly executed as a true-to-the-source biopic and taking many liberties with the real life facts of Ip’s life. This is true- in real life, Ip chose to work as a police officer through hard times and was never forced into labour by the Japanese. But Ip Man works as a both an entertaining film and a tribute to Bruce Lee’s former mentor despite taking story liberties. Rather than being historically accurate, it takes the essence of the character and places him into a scenario which is somewhat more cinematic and appetising than the true tale behind the film. Backing up Donnie Yen in the acting stakes is the seasoned professional Simon Yam, playing Ip’s close friend, Chow, whose relationship with Ip is at times quite sweet and tender and Riki-Oh himself, Fan Siu-wong, a challenger who duels with Ip early in the film in an aggressive show down. The fight choreography in this scene and throughout the film utilises a small amount of wire work but remains (thanks to the immortal Sammo Hung) grounded, brutal and clear, visually honest to the Wing Chung principles. Ip Man achieves what a lot of films fail to do, especially in the current climate of big-budget but shallow action films coming from both Hollywood and Asia, it weaves tough, exciting and fresh fight scenes with an involving tale of a character we genuinely care about. This makes it possibly the best post-handover martial arts film to come out of Hong Kong.